Interesting news today which could possibly have a significant impact on Islay in a few years time: Crown Estate awards rights on 6GW Scottish offshore wind power. Why does this matter for Islay? Because one of the sites is just off Machrihanish (i.e. between Islay and southern Kintyre) and another one 13km / 8 miles west of Islay. The sites for development are located 3km off the Atlantic coast of Kintyre due west of Machrihanish and 13km from Islay. The proposed Kintyre wind farm could have a total capacity of up to 378MW from power generated by around 126 turbines covering an area around 70km2. 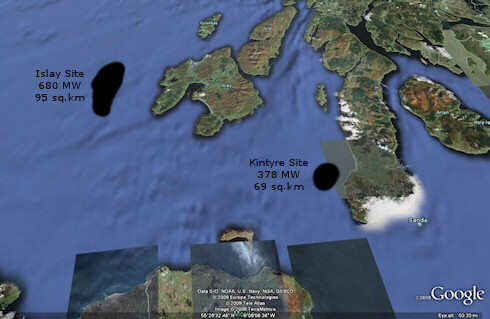 The site off Islay could have a capacity of up to 690MW with around 138 turbines covering an area of around 93km2. While there is quite likely to be some economic benefit if the sites are built how much of it can go to local firms? What will the impact be on the local wildlife, in particular the birdlife if the developments are poorly sited, as RSPB Scotland points out? What is the potential impact on tourism, as the views from Islay are likely to change if the plans go ahead? How will this move towards renewable energy change Argyll in general? Certainly a very interesting project with wide ranging impacts on Islay, Kintrye and Argyll, worth following over the next few years!